How do you build a Cohesive Team? The Five Dysfunctions of a Team is the flagship book from Patrick Lencioni which sold more than 2.5 million copies. Told through a unique fable narrative lens, Pat’s ground breaking theory on teamwork focuses on collective team behaviors that lead to success. The Five Behaviors of a Cohesive Team™ is the result of the partnership between Wiley Workplace Learning Solutions and Patrick Lencioni. 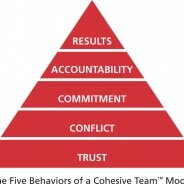 A cohesive team needs to master the five behaviours of building trust, mastering conflict, achieving commitment, embracing accountability, and focusing on results. Each behaviour builds on the previous one and should not be considered in isolation. In addition, team members need to have a meaningful understanding of their own styles and this awareness is achieved through the DiSC® model which is a powerful behavioural tool developed from the work of William Marston. The combination of Lencioni’s team development model and the time tested DiSC® behavioural model provides teams with an edge in where to focus improvement activity. As Authorized Partners, the Convergence Group can offer assessment based programs to measure various aspects of team performance targeting improvement efforts to the most appropriate areas. Using The Five Behaviors of a Cohesive Team™ can be your resource for competitive advantage.